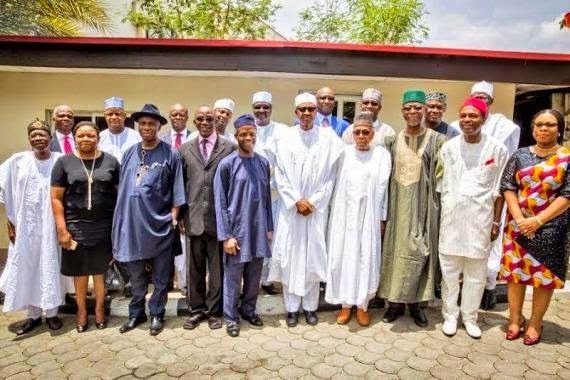 Just as President-elect Muhammadu Buhari was inaugurating his 19-member transition committee led by Mallam Ahmed Joda, the outgoing administration led by President Goodluck Jonathan Wednesday admonished him for forming a parallel government and overheating the polity. The Federal Executive Council (FEC) also rejected the terms of reference brought before it by the transition committee of the incoming administration led by Buhari. Despite the reservations expressed by the present administration, Buhari while inaugurating his transition committee in Abuja, allayed fears that his government, which would assume office on May 29, will be used to persecute its predecessors or to pursue a personal vendetta. He said government is a continuum and all that the incoming government needed to know was where the previous government stopped so that it would know where to continue. Buhari, however, urged the committee to be meticulous and not to overlook the essentials of their engagement with the transition panel representing the outgoing administration. “It is a simple matter but you must have the right information if you are to shape appropriate policy decisions. Needless to repeat that your committee and our government are not on a witch-hunt or to engage in fault finding. “We want the facts and nothing but the facts, what has been done cannot be undone. Our job is to learn from the mistakes of the past in an attempt to avoid similar errors,” he said. On the terms of reference for the committee’s assignment, Buhari said the committee would advise him on the details of the handover notes based on their honest assessment of the situation on the ground. He said the transition committee has two weeks to conclude its assignment. “Your job is to make sure that you do not overlook the essentials. The time given for you to complete your assignment, two weeks, is short but because of the postponement of the election for six weeks from February 14 to March 28, the transition period has been truncated, we are obliged therefore to fast track steps to May 29. “I thank you all collectively and individually for accepting to serve on this committee at a very short notice. The change from one government to another always involves complicated operational challenges and we all know that government is a continuum but the incoming government needs to know where the previous government stopped so that it can know where to continue. “Luckily, you are all outstanding men and women of competence and experience in different fields, so this assignment, onerous though it is, is well within your ability to accomplish. “You are enquired to assess the information provided to you and advise me on its quality and accuracy,” he said. Buhari said the terms of reference of the committee included developing a clear framework for liaison with the outgoing administration for purposes of a smooth handover/takeover and to receive handover documents from the ministries, departments and agencies (MDAs) and itemise the most important or most urgent issues confronting the incoming government. He said the committee was also saddled with reviewing and making a preliminary assessment of the balance sheet of government with particular emphasis on the status of the assets and liabilities of government; cash flow position of the government; quantum of public domestic and external debt of government and their deployment; government’s outstanding contractual obligations and its ability to meet such obligations; and the status of implementation of capital projects. The committee is also expected to undertake a preliminary assessment of the security challenges facing the country and the counter-insurgency measures taken by the government thus far; and the counter-policy measures being implemented in the Niger Delta to deal with unrests and major economic crimes in the area. In particular, the status of the Amnesty Programme, the readiness of the police and other national security and intelligence agencies in addressing threats to law and order, and to provide a brief overview of the Central Bank of Nigeria (CBN), Nigerian National Petroleum Corporation (NNPC), Nigerian Communications Commission (NCC), Nigerian Customs Service (NCS), and the Federal Inland Revenue Service (FIRS). Other terms of reference for the committee included to suggest “quick fixes” which will result in tangible, visible and practical measures so that “change” will be seen after 30 days, after 100 days, after six months of the administration taking office, and to make any other observations which in view of the committee would be helpful to the transition and take off of the new administration. The committee has as its members, Joda, Dr. Doyin Salami (Vice-Chairman), Mr. Adamu Adamu (Secretary), Mr. Wale Edun, Mrs. Bola Adesola, Mr. Festus Odimegwu, Mrs. Nike Aboderin, Chief John Oyegun, Mr. Rotimi Amaechi, Chief Audu Ogbeh, Mr. Boss Mustapha, Senator Hadi Sirika, Dr. Ogbonaya Onu, Alhaji Abubakar Malami (SAN), General Lawal Jafar Isa, Mr. Mohammed Hayatudeen, Mr. Solomon Dalong, Prof. Tam David West and Alhaji Lai Mohammed. But just at Buhari’s transition committee was being given its terms of reference, Jonathan yesterday warned the president-elect against forming a parallel government and overheating the polity. Minister of National Planning Abubakar Sulaiman, who briefed State House correspondents in the company of the Information Minister, Patricia Akwashiki, after the weekly FEC meeting, said through its actions and utterances, the incoming government was overheating the polity and carrying out actions which tends to undermine the powers of the president. The National Planning Minister, who is also the sub-committee chairman of the federal government’s transition committee, said FEC rejected the terms of reference brought before it by the transition committee of the incoming government. According to Sulaiman, “We did receive from the incoming government its transition committee’s terms of reference which we looked at critically. And council did agree that Dr. Goodluck Ebele Jonathan remains in charge of the current government of this country. “The incoming government should avoid creating a parallel government while the current government is still in place. “We take exception to some utterances, to some of the terms of reference that look as if the current government is being stampeded or intimidated. “Council frowned on most of the statements, most of the provisions and council members are advised to work in line with the terms of reference of the current government. “Council members are also to ensure that the terms of reference, as formatted by our transition committee, should be strictly complied with. “When the incoming government takes over they can come out with their programmes, they can come out with their own agenda, they can decide to come out with policies with the way they feel like. “This government remains resolute on the various programmes and projects it is pursuing and the government will continue to do that until the morning of May 29. “While council enjoined members to be steadfast, Mr. President also enjoined members to come out with programmes, projects to be commissioned, that need to be inspected, and members in council should work as part of the government and should perform their work without intimidation. “Also, civil servants, directors, directors general should see this government as the current government and not do anything that will rock the boat so as not to put this country in a bad light. “These are the issues before the (federal government’s) transition committee, these are issues that were raised on the transition programme. The minister added that Jonathan’s magnanimity should not be taken for cowardice, adding: “That is why Mr. President and indeed council members enjoined the Nigerian people to see the olive branch extended to Nigerians and the international community as a way of keeping this country intact. He told journalists that the federal government's transition committee has in its possession two presentations for the incoming administration – the executive summaries of all the MDA handover notes and the detailed handover notes from almost all the MDAs.